This review first appeared in the February 21, 2008 issue of the North County Times. 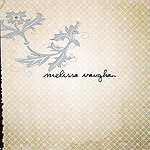 In the two years since she's begun her career as a professional musician, Melissa Vaughan (profiled in the North County Times by your loyal correspondent in September) has clearly learned a ton about arranging, about post-production, about working the sound shape of a studio. Her self-titled debut CD is a polished, confident and poised set of quiet pop and folk  one that belies the general lack of professional experience of someone who's sepnt more time performing on tiny stages at San Diego coffee houses than in larger spaces. The arrangements on the CD put Vaughan's vocals front and center  possessed of an interesting singing voice, slightly nasal with a bit of a rough edge, Vaughan tuns what could be imperfections into her greatest strength outside her songwriting. Vaughan has somehow, somewhere learned the lesson that a perfect voice is no guarnatee of perfect singing. She's more in the tradition of Bob Dylan, of Billie Holiday, of letting her unorthodox tonality shine through to become her immediately recognizable calling card. When she wraps that charming singing voice around the dozen songs of hers found here, the results are often hypnotic, and always beguiling. The album opens with what is probably the strongest track here, "Foolish Friendless Cause"  a sort of alt-rock chamber music. Anchored by Vaughan's singing and piano, the song's sound is defined by the haunting cello and violin harmonizing off the melodic theme. "Queen of Sky Park" is another lovely chamber piece, one with a slower, more stately pace, with Vaughan able to caress each lyric. Just gorgeous. These two songs are likely to be staples of Vaughan's live shows for, well, the rest of her career  they're that close to perfection. And if the rest of the album can't quite live up the level of those two songs, it remains very good indeed, holding out the promise of a lovely career just getting its start  a career hopefully full of more gems like this one.